No single event after the Opium War have had a potentially larger effect on the worlds antiques market than the Chinese Three Gorges dam project. It is therefore of certain importance for the antiques collecting society to keep an eye on what is happening and not singularly trust the antiques trade on values and provenances. Here are some facts collected from the Internet and some useful links. The Three Gorges project proposes to build a hydroelectric project in the Sichuan and Hubei provinces at the middle reaches of China's Yangtze River, flooding one of the worlds most beautiful areas and over 1,200-8,000 cultural antiquities and archaeological sites. As proposed, it represents the largest hydroelectric project in the history of the world. The dam will create a reservoir approximately 400 miles long, permanently submergeing approximately 150,000 acres, including 1500 factories and at least 160 towns. It is designed to generate over 18,000 megawatts of electricity, providing electricity to rural Chinese provinces, provide flood management and improved navigation for the upper Yangtze river. If all proceeds on schedule, in the year 2003, water will fill its huge reservoir at a level of 135 meters above sea level to allow the first group of electrical generators to begin operation. The entire project is to be completed in 2009. The project has generated controversy because of its serious impacts on the ecology and environment in the region and the large scale resettlement required to complete the project. Between one and two million people will lose their homes and have to move away. More than 80 percent of the people to be relocated are in Sichuan the remaining 20 percent lives in Hubei Province. The relocatioin program have so far been largely unsuccesful. If the Chinese government is determined to realize its plan, the next few years will require the relocation of more than 500,000 people in order to raise the water level of the reservoir to the 135-meter mark by the year 2003. By 2009, when the entire dam structure is scheduled to be completed, the water will be raised to 175 meters, and this will require that at least another half million people be moved. Those local officials who still care about the future of their localities are gravely concerned about how this many people can be moved by 2003, as well as the later relocations. Given the problems experienced thus far the targeted population are likely to continue to find ways to resist relocation so that they can stay near the river as long as possible. A likely consequence of such resistance will be the relocation of an enormous number of people within a short period just before the water is raised to the 135-meter mark. Ancient temples, as well as burial grounds and other historic sites, will be lost beneath the lake. Archaeologists estimate that approximately 8,000 cultural sites will be flooded. In People's Daily 8/16/98 are mentioned that the start of construction of the Three Gorges dam has made many historical artifacts more accessible. If vigilance lags just a little the artifacts are stolen by smugglers. Chongqing Municipality customs reports a rapid increase in historical artifact theft in the Three Gorges area but also the recovery of some stolen national cultural treasures. In 28 cases 182 artifacts were recovered. Archaeologists and government workers who "lack personnel and funding" will have to quickly excavate sites to rescue relics before they are flooded. The rushed nature of the work are likely to open the door to illegal excavations. China Daily reported 03/02/99 that archaeological excavations at the Three Gorges Dam Project area have attracted scholars and archaeologists from around the country. They are there to participate in the project's relics conservation plan completed in the middle of 1996, suggesting the excavation of major historical sites, moving important buildings and carvings, and protecting special monuments at the site. A group of archaeologists from the Institute of Vertebrate Palaeontology and Palaeoanthropology under the Chinese Academy of Sciences, Beijing University, Sichuan University, Jilin University and Chongqing Museum launched their excavations in the dam area October 1998. Their excavations in Lijiaba Site in Yunyang County, a Shang Dynasty site (circa 1600-1100 BC) to the Han Dynasty (206 BC-AD 220), have resulted in rich discoveries. Bronze weapons found at the Lijiaba site are believed to be very important discoveries concerning the ancient Ba and Shu cultures. A specialist from the State Bureau of Cultural Relics said that the Lijiaba site will be indispensable for future study of the Ba and Shu cultures. At the same time, excavations at the Zhongba site in Zhongxian County have unearthed remains that belong to the Neolithic Period. In the Suolong site in Wushan County, archaeologists determined that the excavated pottery, stone and boneware were important remains of the Longshan Culture, which also belonged to the Neolithic Period. The Chongqing Museum group has also found a valuable ancient tomb of the Six Dynasties (AD 220-589). As early as 1996 the following was reported that the dam project will destroy evidence of human habitation in the valley dating as early as the Palaeolithic. A group of 50 Chinese intellectuals, including prominent archaeologists and former government officials, recently petitioned Jiang Zemin, China's president, to speed the distribution of the $37.5 million earmarked for the rescue of archaeological sites threatened by the dam's construction. So far this money has not materialized, and salvage excavations have ground to a halt. Dam engineers have begun flooding the Yangtze Valley, forcing residents to move. Zhongbaodao, a Neolithic site near Yichang, is already under water. 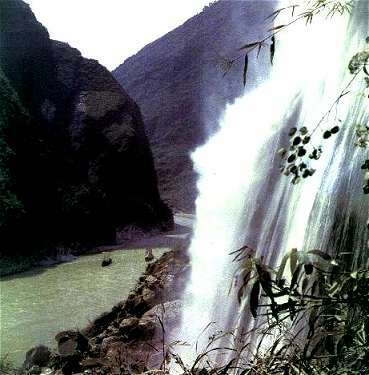 Next year some 130 sites in Xiling Gorge, many dating as far back as the Neolithic, will be inundated. While Chinese archaeologists are obliged to help in the salvage operation, no team has been assembled to work exclusively on the project. Scattered salvage excavations have revealed that the Yangtze River Valley rivals the Yellow River Valley 300 miles to the north in its importance to the study of the origins of the Chinese people. 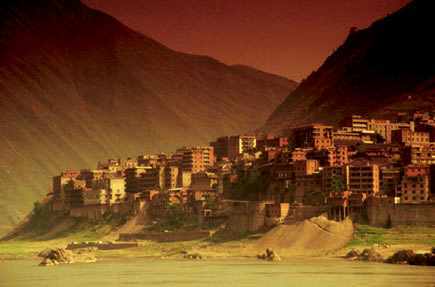 Archaeologists have traditionally identified the northern valley as the cradle of Chinese civilization. 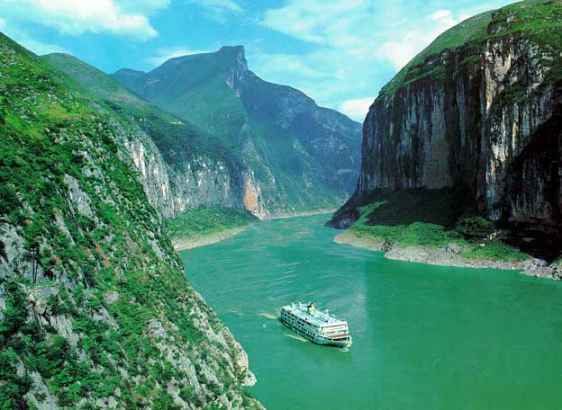 Only in the past 15 years has the Yangtze region been identified as an early and important cultural center. Ceramics recently found at Neolithic sites in the Three Gorges area are more varied in shape, color, and decoration than those produced at the same time in the north. Evidence of a heretofore unknown bronze-working tradition that may be linked to an obscure people called the Ba (ca. 2000-220 B.C.) has been discovered in eastern Sichuan. Known for its boat-shaped coffins and distinctive weaponry, the Ba culture is now thought to be more widespread, more influential, and more than 1,000 years older than previously believed. The Ba appear to have settled the middle Yangtze from west of Yichang to Yibin, some 140 miles west of Chongqing. A third-century B.C. Ba royal cemetery at Xiaotianxi has yielded bronze weaponry indicating wealth, power, and extraordinary artistic imagination. Yu Weichao, director of the National History Museum of China and head of the project's salvage excavation team, says "the sites in this area are too valuable to be lost.... We must remember that protecting cultural relics enhances everyone's understanding of ancient cultures."